We’ve got the release date for Concussion to Blu-ray Disc and the new Ultra HD Blu-ray disc format from Sony Pictures Home Entertainment. The Golden Globe-nominated film will be available on both Blu-ray types, as well as On Demand and DVD on March 29th, 2016. On Ultra HD Blu-ray, the video is formatted in 2160p “4k” at 2.39:1 aspect ratio with audio in both Dolby Atmos and Dolby TrueHD 7.1 (English). The standard Blu-ray edition is formatted in 1080p at 2.39:1 aspect ratio, with audio in English DTS-HD Master Audio 5.1. 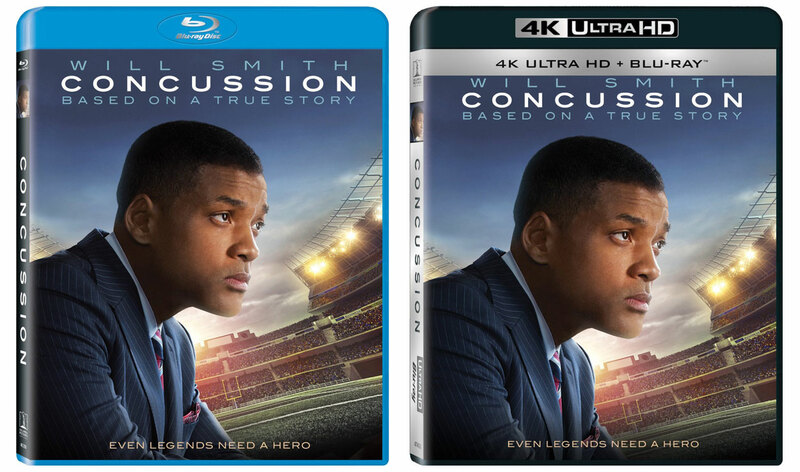 Suggested retail price for Concussion on Ultra HD is $45.99, while the conventional Blu-ray edition carries an MSRP of $34.99. However, pre-orders are currently being taken for $26.99 and $22.99 on Amazon, respectively. We don’t have a confirmed date for the release of Concussion to Digital HD yet, but it’s expected to hit cloud servers on March 15, 2016. In Concussion, Will Smith stars as American immigrant Dr. Bennet Omaul who made the first discovery of the football-related brain trauma condition CTE. Oscar-nominated actors Alec Baldwin and Albert Brooks also star in the film. Get more news on Ultra HD Blu-ray Disc releases.